Considering the oil industry is one of the most lucrative in the world there is not really an overwhelming abundance of oil-based slots out there. Maybe it’s because oil is dull? Who knows?! 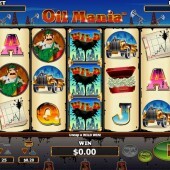 Oil Mania from slot developer NextGen Gaming bucks that trend and uses the oil industry as its theme to lure players in. This 5 reel, 25 pay-line slot puts you into the thick of the action of the oil fields in what initially appears to be Texas. The reels are set against an oilfield with oil rigs and oil pumps in silhouette form making up the background. Symbols on the reels include an oil mechanic, a statistics graph, a chest of cash, an expensive-looking car and the standard 9 through to Ace symbols. At first glance, this does not appear to be a slot that is buzzing with excitement. It Is All About the Upwild Bonus... Literally! However, the excitement is not found in the graphics or the theme. The real joy can be found when you dig a little deeper and start spinning. Now, this slot does not have much going on but it is worth sticking to it just to experience the Upwild Bonus. 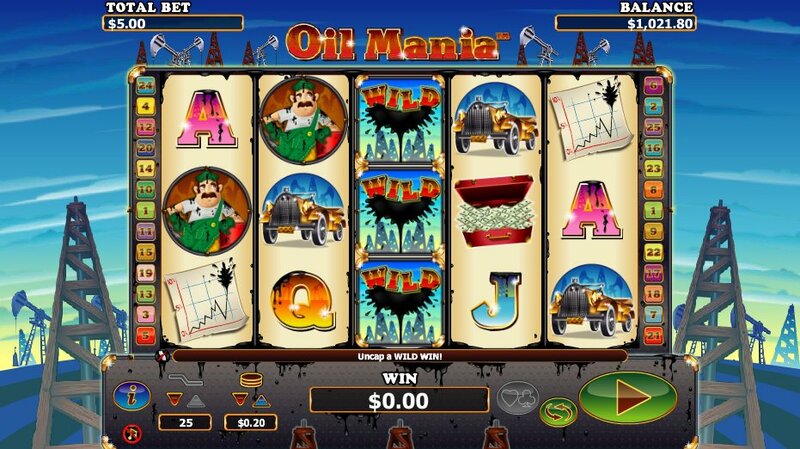 The Upwild Bonus is triggered when you hit the oil tycoon bonus symbol on the reels. Once triggered, you will be awarded 3 free spins. On the first spin, the bottom symbol on the reel that the oil tycoon bonus symbol appeared on to trigger the bonus feature will turn Wild. On the second spin, the bottom symbol will remain Wild and the symbol above will also turn Wild. On the final spin, all three symbols on that one reel will turn Wild. Unfortunately, that is pretty much where the action begins and ends for Oil Mania. It is more limited than other NextGen Gaming slots such as the US gold rush-themed California Gold and the impressive Foxin’ Wins but it does still have a one trick pony appeal to it that will lure in a lot of slots players. Personally, I did enjoy playing this slot. It is basic and it could have done with some more bonus features or even a Pick’Em Bonus would have sufficed but when you hit the Upwild Bonus it does feel like all the spins you have spun up until that point are worth it. You won’t find payouts that come much bigger for just 3 free spins.